The Schlage Accent Lever Hall and Closet Lock in Matte Black is perfect for use on doors where locking is not needed. 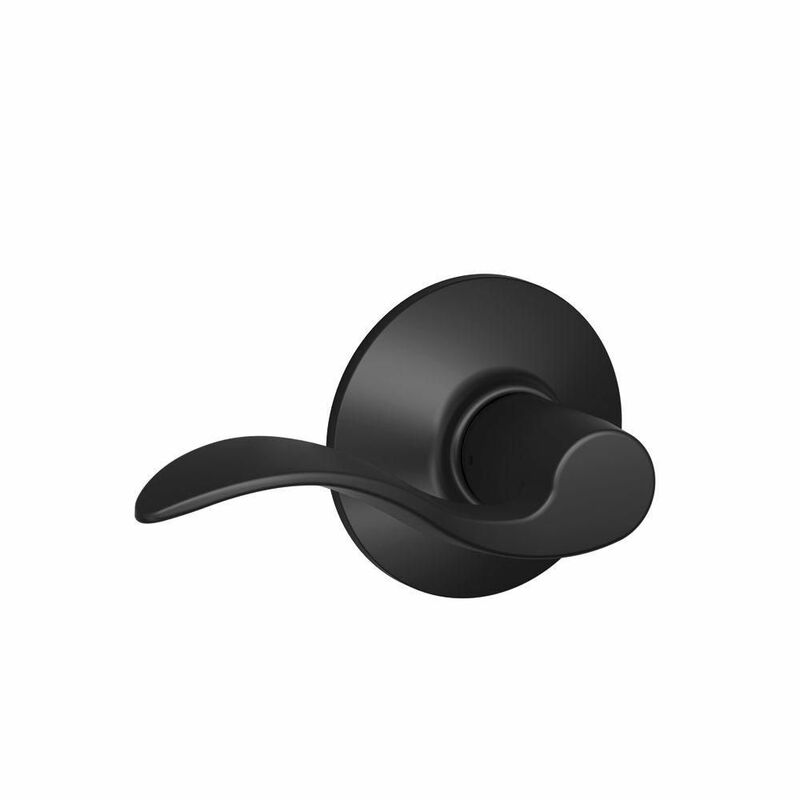 The Accent Lever is widely popular for its elegant wave-like design that effortlessly matches a room's style without overshadowing it, and looks especially elegant when finished in Matte Black. Plus, it's been designed and tested with strength and durability in mind. The Latitude non-locking lever with Century Decorative Rose in Bright Chrome is ideal for closets and rooms where locking is not needed. Schlage Collections offer knobs, levers, handlesets and electronics that create a suited look throughout the home. Accent Hall and Closet Passage Lever in Matte Black The Schlage Accent Lever Hall and Closet Lock in Matte Black is perfect for use on doors where locking is not needed. The Accent Lever is widely popular for its elegant wave-like design that effortlessly matches a room's style without overshadowing it, and looks especially elegant when finished in Matte Black. Plus, it's been designed and tested with strength and durability in mind. Accent Hall and Closet Passage Lever in Matte Black is rated 4.8 out of 5 by 15. Rated 5 out of 5 by HomeDepotCustomer from Worked as expected.... Worked as expected. Rated 5 out of 5 by Jared from Comes with front and back handles. Great Matte finish. ... Comes with front and back handles. Great Matte finish. Rated 5 out of 5 by Robert from Easy to install and works great!... Easy to install and works great! Rated 5 out of 5 by Victoria from Very handsome when installed, but I did occasionally need my... Very handsome when installed, but I did occasionally need my husband’s brute strength when I wanted to reverse the handles. Rated 5 out of 5 by sandybar from Great product. Love the matte black color. Great product. Love the matte black color.